6.1.2014 At the end of September, 2013, a clean-out-the-closets attack coincided with a craft attack (see 10.6.2013). I pulled out a t-shirt that Jim had purchased at a Hilltribe artisan center in Thailand in 1990. The hemp t-shirt had been worn throughout our trip and was stained -- and it isn't the type of think Jim would wear around here anyway. 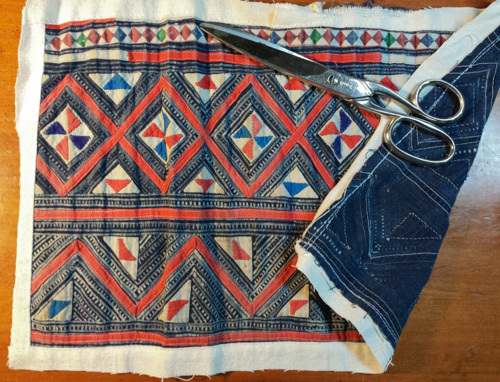 Sewn onto the front of the shirt was what turned out to be an old Hmong tribe textile -- lots of appliquéd triangles on resist-dyed indigo cloth. I was inspired. Really, I was seized, like some magic jumped out of the fabric and into my soul. We went to Barnes & Noble to buy a book on appliqué. I did buy a book on appliqué (lots of flowers, nothing exotic) but also got one on quilting. Maybe it was the Hmong textile spirit or maybe it was one of my own shoulder pundits, but something told me I might not be ready to replicate ethnic handicraft. I dove into the quilting. Now, eight months later, I'm circling back to hand work. (See my latest "pocket-haven" entry.) 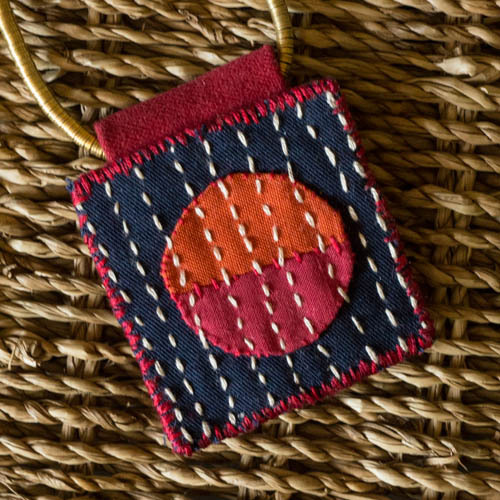 I sidetracked from my shades-of-blue project to try tiny wearable medallions of cloth: an appliqué on a 2-inch square of indigo blue cloth, quilted with Japanese-style sashiko stitches. 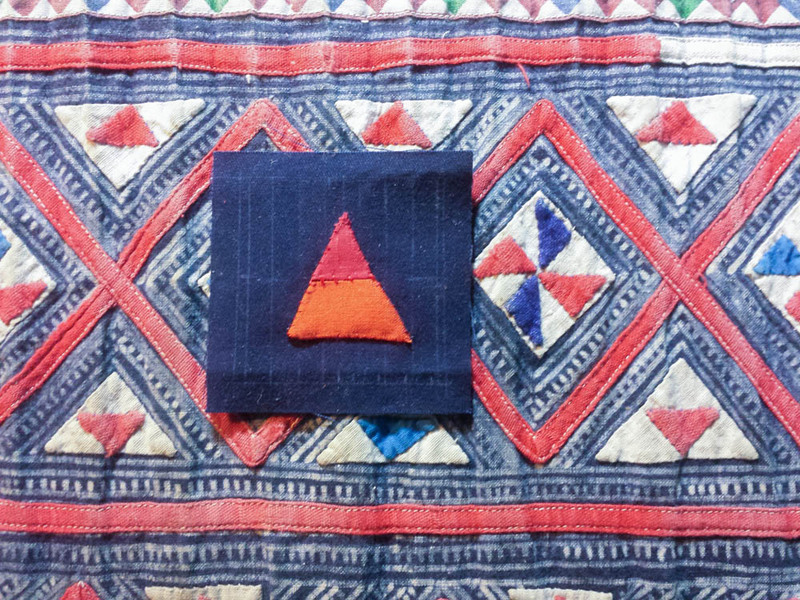 This morning I appliquéd a triangle, with stitches nearly as tiny as the Hmong appliqué and I pulled it out to celebrate as I reached around to give myself a little pat on the back. My triangle is in two pieces, mended together. I'm thinking of that as talisman for healing. By the way if anyone is interested in learning appliqué, I recommend a set of videos by Jan Patek on YouTube -- very good teacher, very down to earth, excellent video quality.